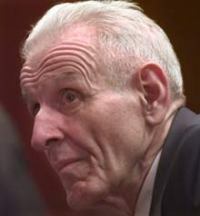 Jack Kevorkian, the retired pathologist dubbed "Dr. Death" after claiming he had participated in at least 130 assisted suicides, left prison after eight years. A smiling Kevorkian said the release was "one of the high points of life" as he walked out with his attorney and "60 Minutes" correspondent Mike Wallace. Inmates inside the prison had been milling about all morning for a glimpse of the 79-year-old, while reporters and television vans greeted him on the outside with cameras and questions. Attorney Mayer Morganroth said his client planned a news conference next week. Throughout the 1990s, Kevorkian challenged authorities to make his actions legal or try to stop him. He burned state orders against him and showed up at court in costume. "You think I'm going to obey the law? You're crazy," he said in 1998 shortly before he was accused and then convicted of murder after injecting lethal drugs into Thomas Youk, 52, an Oakland County man suffering from Lou Gehrig's disease. That conviction earned Kevorkian a 10- to 25-year sentence for second degree murder, but he earned time off his sentence for good behavior. On Friday, the 79-year-old, wearing a blue sweater, walked out of the Lakeland Correctional Facility, accompanied by his attorney, Mayer Morganroth. He is expected to now move to Bloomfield Hills, just outside Detroit, where he will live with friends and resume the artistic and musical hobbies he missed while in prison. His lawyer and friends have said he plans to live on a small pension and Social Security while doing some writing and make some speeches, although he said he doesn't expect them all to be on euthanasia or assisted suicide. Kevorkian has promised never to help in another assisted suicide. But Ruth Holmes, who has worked as his legal assistant and handled his correspondence while he was in prison, said his views on the subject haven't changed. "This should be a matter that is handled as a fundamental human right that is between the patient, the doctor, his family and his God," Holmes said of Kevorkian's beliefs.